WriteClub London is at the Barbican in August! 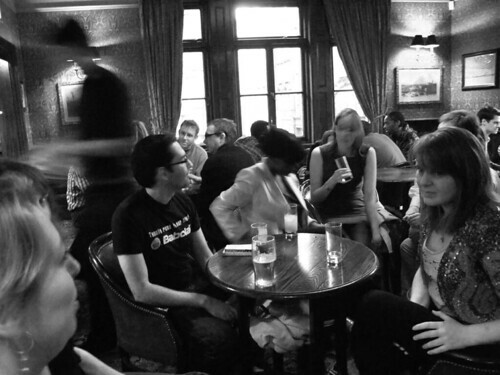 If you write stuff, and live in London, I recommend you pop along to WriteClub London casual chats with other writery-types, because in August they’re meeting at the Barbican, as part of the Hack the Barbican event. For four weeks between 5-31 August 2013 the cavernous foyer areas of The Barbican will be taken over by London’s biggest ever experiment in cross-disciplinary collaboration. Bringing together artists, technologists and entrepreneurs, Hack The Barbican sets out to explore new boundaries and reinterpret one of the world’s great cultural centres. Nothing is off limits. Everything is open to question. In practice, what it means is that we get to talk writing and enjoy a drink or two in the splendid Brutalist vision of tomorrow that is the Barbican foyer. We’re in Alcove 1 of the Mezzanine – I’ll ping through an exact description of where that is once I’ve walked the ground myself. And being part of HtB should bring us some fascinating new tech, media and arts people to talk writing with , too! More details to follow – in the meantime, I’m looking forward to seeing you there on the 15th, as ever from 7pm until late. And of course, we’ll be back in our usual venue at the Yorkshire Grey in September. Visit the WriteClub London meetup page for full details. And if you’re in Brighton, don’t forget that there is a thriving WriteClub group for you too! You are invited to a very special WriteClub event: BookMachine Brighton. Join us on Thursday 7 February at 7:00 PM for an evening of networking with writers, designers, publishers, marketers, app developers and students. BookMachine is a group for people in the publishing industry and anyone who loves books. They run events in Edinburgh, London, New York, Oxford and now Brighton! Thanks to Alice Reeves and the good people at BookMachine for organising this event. For the past three years, writers in Brighton and London have met to chat about writing, reading, freelancing and everything else. WriteClub is a low-key, totally open and deeply informal gathering that happens twice a month. If you write stuff, want to write stuff or want to talk about words, creating stories or even making a living as a writer, come along! You can share ideas and discuss methods with other writery-types. Morning: Meets once a month at Small Batch Coffee, Jubilee Street, Brighton. Meetings are on the second Thursday of the month 9:00 – 10:00(ish). Evening: Once a month, this lovely bunch of people assemble at the Earth & Stars pub. Alice Reeves recently joined Helen Keevy and Rob Shepherd as an evening host. – there’s not much difference between the two meetings, but the morning ones tend to be quieter (i.e. fewer people) and the evening ones have the added benefit of booze (though Small Batch coffee is a delicious and energising substitute). 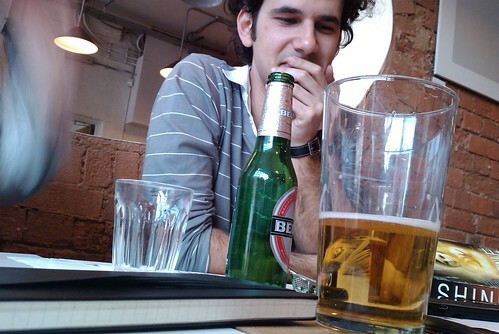 WriteClub London is hosted by copywriter and ‘weird fiction’ writer Al Robertson. 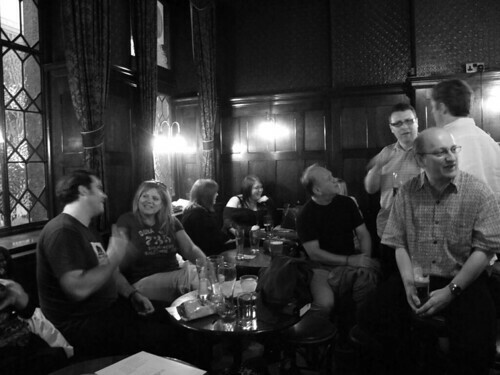 You can find out all about the London group by visiting the WriteClub Meetup page. All kinds of writers – journalists, sci-fi authors, poets, creative entrepreneurs and copywriters have gathered for the past nine months to mingle, mooch, booze and schmooze. Meetings were quiet, consisting mainly of friends, acquaintances and people off Twitter. But last month something changed. Thanks to our new meetup.com profile, created by co-host Al Robertson, our last meeting was throbbing with new members! Since that lovely evening we’ve had more new members joining the WriteClub London Meetup group, with 20 confirmed attendees and a few more ‘maybes’. Many people question their own status as a writer, thinking that to come to WriteClub you need to be a professional writer, or published. But that’s nonsense. We’re a group for all kinds of writers and non-writers, so even if your writing achievements have been limited to intentions or daydreams – you’re very welcome to join us. WriteClub is a very relaxed group, and one of our goals is to create a space for people to think and talk about writing. You may find inspiration or renewed enthusiasm for writing after spending an evening with similarly-minded folk. And of course the conversations are not limited to writing – chat tends to drift off in all kinds of unexpected directions. We meet in a pub that’s open to the public. You don’t need a ticket and there’s no cost to attend. We don’t do formal introductions or group discussions. We don’t have rules or a format. There’s no big agenda either. The group is here for you, to be whatever you want it to be. See you there! WriteClub now has a logo! WriteClub has always been a loose connection of people, tumbled together with a light sprinkling of organisation, but the opportunity to have a logo and give our group an identity was warmly received. WriteClub owes a massive thanks to Ayse Kongur, the graphic designer and WriteClub member who designed our lovely logo. Thanks Ayse! Ayse is a very experienced graphic designer who also travels widely, reporting on the graphic design industry and interviewing talented designers around the world. This Thursday, WriteClub returns to London. So if you write stuff, or occasionally think about writing stuff, then join us! WriteClub is a friendly, informal networking group for all kinds of writers. It’s a chance for people to meet other writers, swap tips, ask questions and meet good people to pass work to. We’ll be in the Yorkshire Grey pub. To spot the group just look for books.